Home»Security»Watch out, Free iPad Bid , turns out a Trap Click! Watch out, Free iPad Bid , turns out a Trap Click! Trend Micro identifies a trap click of cyber crime to Facebook users worldwide, one of them, on my country. 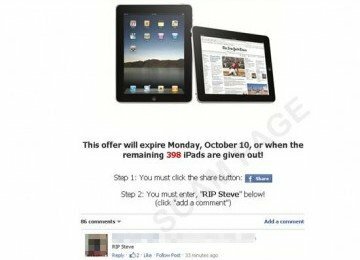 In this case the user is prompted to share and comment on the death of Steve Jobs to get the prize thousands of iPad. This contest ends until October 10, 2011. This information has been detected spread by viral, and indirectly provide fraud for millions of Facebook users around the world. Initially Trend Micro, have found a website that contains information to distribute of thousands iPad along with Jobs death to share links for facebook user, once asked to comment on the incident. But when link clicked that appears about information that program does not exist in the area concerned, rather than thousands reward of iPad, this just advertising offers from some products raised by the scammers. Obviously the scammers will benefit from ad-click and viewed by the victim clicks. Profit increases if users share links to friends. This incident was reminiscent of all Facebook users, in order to keep raising awareness so that they are more careful in various motives deception launched by these scammers, especially things that require you to click something, it is very important. Could Turnstiles Be a Secured Method of Control During the Holidays?